Flower Delivery Oregon Judy's Central Point Florist | Making the occasion special for more than 34 years.Flower Delivery Oregon Judy's Central Point Florist - Making the occasion special for more than 34 years. If you are looking for flowers for Mothers Day you have come to the right place. Judy’s Central Point Florist and Judy’s Grants Pass Florist have lots of fresh flowers for Mothers Day, ready for delivery, each and every year. 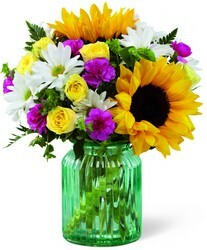 We also offer many ways to order; call us, stop in or order online at www.judysflorist .com. Here is a bouquet that will be popular when folks are looking for flowers for Mother’s Day 2016. 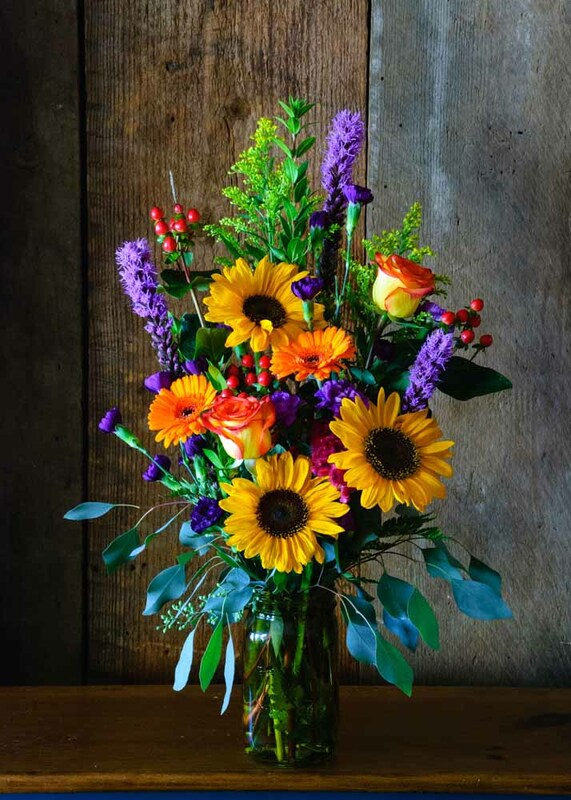 The FTD Sunlit Meadows Bouquet by Better Homes and Gardens will be a Mom favorite. 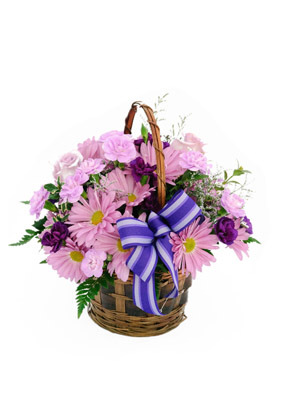 This beautiful bouquet makes a fantastic way to add color charm to your Mother’s Day celebration. 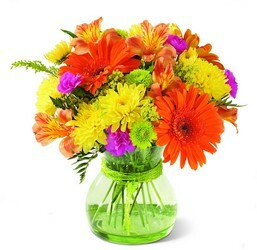 Its brilliant color comes from the combination of brilliant sunflowers, yellow spray roses, magenta mini carnations, white traditional daisies and lush green accents in an aqua blue canister glass vase. Its “fresh from the garden” is sure to please everyone who sees it. Another design that is sure to be a hit this year is The FTD Sweet Devotion Bouquet by Better Homes and Gardens. This amazing Mother’s Day bouquet has been brought back this year by popular demand and still offerss all the beauty any mom could hope for this Mother’s Day. 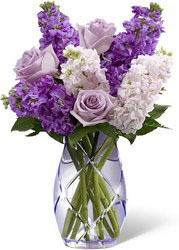 Lavender roses with textured columns of lavender and pink flowers and accented with vibrant, lush greens in a heavy, lilac-hued glass vase cut all around with a sparkling lattice. This fantastic design starts at only 39.99. Our delivery areas include nearly every address here in the Rogue Valley and Southern Oregon. If you need to send something to Mom and she lives outside our delivery area, we can always send your flowers through FTD. And when Judy’s takes care of your order for flowers for Mothers Day, we guarantee them no matter where they are delivered. Call us in the Medford area at 541-664-1878, in Grants Pass at 541-476-9001 or at 800-664-1878. I think custom flower design is much like song writing. Many can write a good tune but few can write great songs. Custom flower design takes the vision of the customer or the designer and brings the design to life. Custom flower design can be simple or elaborate. Our designers can help you design a wedding from bottom to top but we are just as happy to custom design an arrangement you need delivered for someone’s birthday. Simply give us a call and we can help help you say with flowers what you want to say. Above is a good example of Custom Flower Design. One of our amazing customers brought the potty chair into us and asked us for a custom design for a baby shower. Perfect. That is the design we came up with and our customer was able to deliver something that was not only unique but also beautiful and would later be useful too. Custom flower design and sympathy. 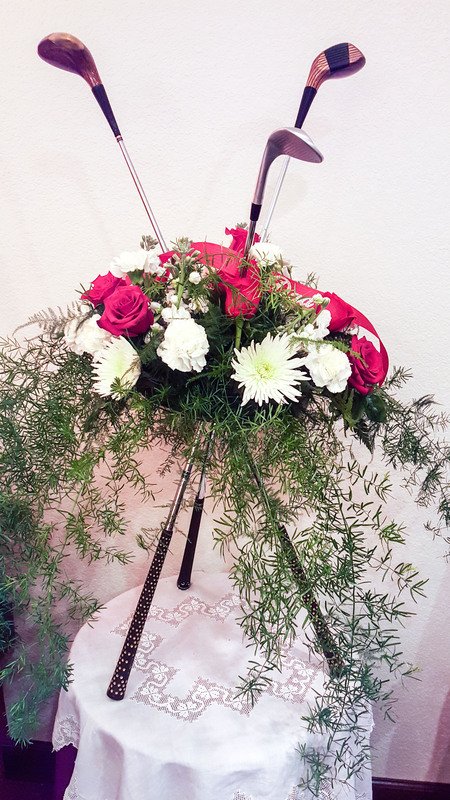 Below is an example of a sympathy design for an avid golfer. His family brought in the golf clubs and asked us to create a unique design. We put our heads together and created two golf club stands like the one shown here. So, when you need custom flower design think of Judy’s Florist or of your local florist to get the very best in creativity. There are many places that you can buy flowers these days but very few places that can design them to your vision standards. Your quality, local florist will be happy to talk with you about your custom design needs. For flower delivery Eagle Point Oregon, you have found a flower shop that can take care of you. In fact, we deliver to Eagle Point Oregon at least every day and usually two or three times per day. Judy’s Central Point Florist & Gifts is 10 or maybe 15 minutes away from Eagle Point. The delivery fee to all city limit addresses will be just $12.99. Eagle Point Oregon addresses that send us out into the woods will have a bit more of a delivery fee. 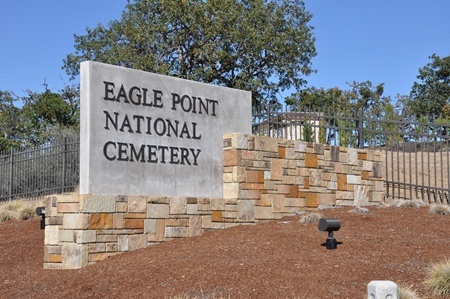 Our most common delivery destination for flower delivery Eagle Point Oregon is to the Eagle Point National Cemetery. This cemetery is located at 2763 Riley Rd in Eagle Point and is about 14 miles North East of Medford, Oregon. When we deliver flowers for services to this cemetery, we arrive just one half hour before each service. Almost all services take place in the shelter so, unless other arrangements are made we will deliver all floral designs and or plants directly to the shelter. For all other flower delivery Eagle Point Oregon, we just need to know who, what, where and when and we will take care of the rest. We even deliver daily to Eagle Point schools. For products, we have an amazing selection of the freshest flowers and we receive fresh flowers almost every day. We also offer balloons, green plants, blooming plants, candles, silk design, stuffed animals and more. For design, we specialize in weddings, everyday designs, funeral services, holiday design and more. So, if you need flower delivery Eagle Point Oregon, think of Judy’s Central Point Florist and gifts. We can be found online at judysflorist.com, you can call us at 541-664-1878 or stop in and see us at 337 East Pine St. Central Point, Oregon. We look forward to serving you and taking care of all of your floral and gift needs. Flowers are fantastic for sending or helping to convey an emotion. They are sent for holidays and special occasions. They are given as a romantic gesture or to celebrate an anniversary. They are sent as a get well gift or simply to lift someones spirits. They are sent to celebrate peoples life or sent in sympathy to console those who lost a loved one. Flowers are fantastic because they make people feel better. Flowers are fantastic for holidays because your local florist can make it a simple way to express your emotion. Here at Judy’s Central Point Florist and Gifts our biggest holidays include; Christmas, Valentines Day, Mother’s Day and Thanksgiving. We strive to offer not only the freshest of flowers but also the most creative holiday designs. Flowers are fantastic for the day to day occasions as well. The most common are just because, anniversaries, weddings, birthdays and for get well. We offer many beautiful designs for each of these occasions as well. For sympathy designs and for celebrations of life there is no limit to how we can help. We deliver to all of the churches, cemeteries and funeral homes here in the Rogue Valley, for funeral services. When there is a memorial service we can deliver to any local Southern Oregon address too. Sometimes you’ll just want to let someone know that you are thinking of them during their time of loss. Whatever your sympathy needs, we are here to help. Grandparents Day is on Sunday the 13th this year! Grandparents Day Flowers 2015- This is not a big florist holiday but it does seem to grow a bit every year. Because we offer spring flowers all year we see many orders for items like the Color Your Day with Beauty or the FTD Because You’re Special bouquets. And as we are heading into autumn, we will see lots of designs in fall and autumn colors as well. When ordering Grandparents Day Flowers 2015 – Judys Florist always offers you a 100% guarantee of satisfaction. So, choose Judy’s or another Real Local Florist that you can count on. You will not only get what you pay for but in many instances you can save as much as 20 or 30% on your local flower delivery. Saving money flower orders is never a bad thing. What is Grandparent’s Day? Per Wikipedia, Grandparent’s Day began in 1970. Marian Lucille Herndon McQuade, a West Virginia housewife, initiated the campaign for this special day. It started out as a statewide Grandparents Day event in 1973 and grew into National Grandparents Day in 1978. Grandparent’s Day is celebrated each September and always on the first Sunday following Labor Day. Grandparent’s Day is an event started by one, then a few, and is now celebrated by millions each and every year . Can you get help with your Grandparents Day flowers 2015? Absolutely! We have ideas on our Grandparents Day page on www.judysflorist.com website or you can simply call us and we can help you with any and all of your flower questions or flower needs. We are open Monday through Friday from 9am till 5pm and Saturday from 9am till 2pm. If you choose to order online, you can do so 24 hours each day. In fact you can get same day delivery to many of our local addresses up until 3:30pm. Call us if you have “any” questions… 541-664-1878 or 800-664-1878. Than you from, All of us here at Judy’s Central Point Florist and Gifts. Yes we offer Fathers Day flowers and we have some other good gift ideas too. Believe it or not Father’s are touched by flowers too. Clearly Fathers Day flowers are not as popular as flowers for Mom but, we are just as ready to help out for either holiday. Father’s Day is the 3rd Sunday in June and we are closed on Sunday. How does that work? Simple, you can surprise dad with Fathers Day flowers at the office during the week or we do offer flower delivery every Saturday too. Call us and just let us know when and where and we can get flowers or gifts to day in time for his big day. Fathers Day Flowers are one idea but we offer many ideas for dads. We have green plants, blooming plants, balloons, chocolates, candy bouquets and more. For the last few years our Judy’s Coke Break has been a favorite. It comes with a six pack of Coke in the old fashioned bottles. We then design in a wide variety of those long time, chocolate bar favorites. We then wrap with cello and finish it up with a great big bow. For green plants design we have a few ideas dad might love. We have a big red jeep that we can fill with a beautiful green plant and deliver. We also have a bright yellow Smile Mug that can be filled with plants too. An old time favorite for Green Plants for dad has been to design them right into a coffee mug. Anything you need including Fathers Day Flowers, we are here to help. Even if you just have a question for us. You can reach us at Judy’s Central Point Florist, online at www.judysflorist.com or call us at 541-664-1878. For a real local florist, think of us here at Judy’s. Ahhh, Summer is almost here and with June comes Summer flowers Southern Oregon. Our flower growing season here in the Medford Oregon florist area is fairly limited. In fact, most of the flowers sold in the United States come from South America. So, when summer flowers Southern Oregon become available they are always welcome. We integrate our local flowers each summer with flowers from South America, California, Hawaii and sometimes even from Europe. This week we even had a rare shipment in, on a very specific flower, from South Africa. While we love the local summer flowers Southern Oregon that we receive it is difficult to design without the addition of other flowers from around the world. Some of the more popular flowers include Peonies which are available in May and June, Sunflowers which are available June through October or Snapdragons available July through September. This gives you an idea of the more specific growing season for theses locally grown flowers. These flowers can be available from South America most of each year with their ability to grow all year. If you are in search of locally grown summer flowers Southern Oregon or have a specific flower in mind, call us! We can give you an idea of when your favorite is available. If your favorite flower is not available, when can give you some ideas of flowers that maybe have the same look and feel. So, if you need flowers for a special occasion, a wedding, parties or just because, this summer you will likely see local flowers, grown right here in the Rogue Valley, in your design. If you’d like to see your special design mostly or completely in locally grown flowers, we can likely help you with that too. We have two locations to serve you. Judy’s Central Point Florist, serving deliveries to most of Jackson County and Judy’s Grants Pass Florist and Gifts, serving most of Josephine County. 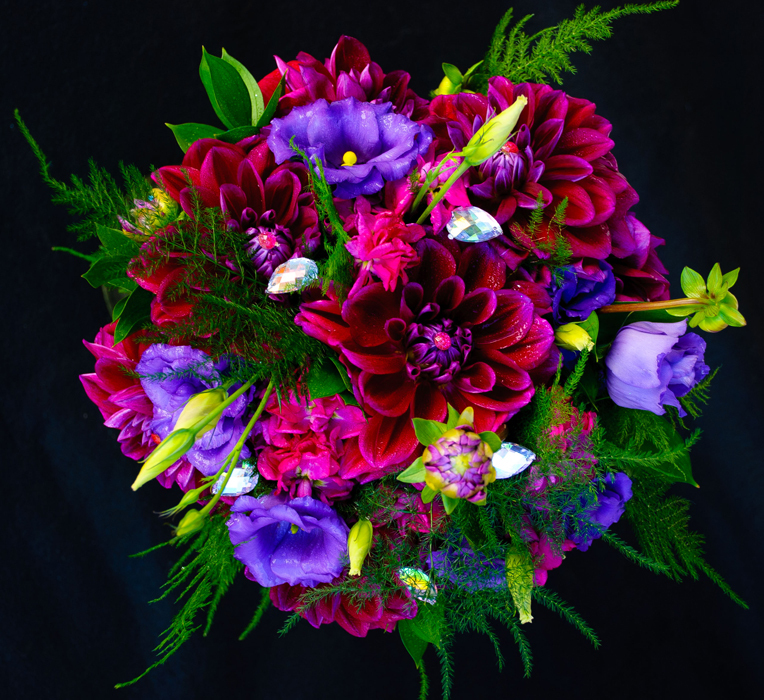 We here at Judy’s Central Point Florist & Gifts are proud to be an Oregon florist. We specialize in high quality floral design and deliver to a large segment of Southern Oregon. As an Oregon Florist and especially in our Rogue Valley area we have some unique issues with flower distribution. Our local climate allows for only a short growing season. We purchase and sell local flowers as often as possible but the available flowers come and go with the changes in season. A local flower available in May, might not be available in June from a local grower. With this in mind, we also rely heavily on out of state and even out of country growers. For many years most of the flowers sold in North America come from South America. A much better climate for year round growing is much of the reason for this state of the Southern Oregon flower world. We love our local growers and we compliment our floral designs with their flowers whenever we can. Another issue we see as a local Southern Oregon florist is distribution. All out of area flowers arrive by plane or by truck. We do not have the advantage that many big cities have when it comes to flower selections. If demand suggests we need a specific flower, we order it and it arrives at least a day later. In the big city, you are usually able to run to the flower market and hand pick the flowers you need and the quantity for the day. Here locally, if we need 10 stems of a specific flower, it is common that we must buy a minimum quantity of those flowers just to have it shipped here. We do also have other avenues for the import of flowers. We work with a number of out of town wholesalers that make weekly stops at our back door. They provide us with some last minute or next day opportunities for flowers but are in a very similar boat as ours. They have to carry what they believe they can sell and there is not much room for carrying “exotic” flowers in their trucks. So, if you are needing a specialty flower or color for an upcoming event from a local Southern Oregon Florist, it is best to give us some lead time. More often than not we can find the flowers for you but it may require a few days to get them in from a location where they are growing. If unavailable anywhere, your Oregon florist can probably give you some ideas of flowers that would make a great substitution. 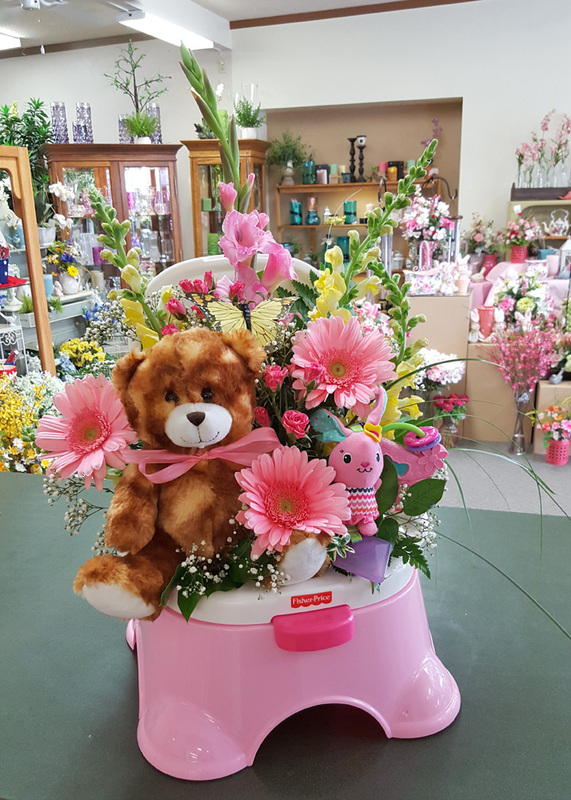 Judy’s Central Point Florist & Gifts has been delivering Mothers Day flowers Medford Oregon and its surrounding cities for more than 26 years. We strive to never run out of the most beautiful flowers before the holiday week passes by. We also keep our phones turned on to help anyone who needs us to delivery some love to their mom (moms) for Mother’s Day. Our delivery area for Mothers Day Flowers Medford Oregon and the surrounding area includes; Central Point, White City, Jacksonville, Eagle Point, Medford, Phoenix, Talent, Gold Hill, Grants Pass and Ashland Oregon. Our delivery charge to deliver to most southern Oregon addresses is just $9.99. We start delivery about 9 am and most deliveries will be completed by 4pm. As this is our largest of holidays find it very difficult to guarantee timed deliveries for the Friday and Saturday of Mother’s Day Week. Here is an idea of one of my favorites for Mothers Day flowers Medford Oregon. 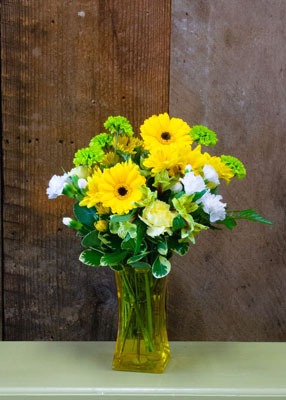 It is called the Sunlit Meadows Bouquet and I think it will be a big hit with our Southern Oregon Mom’s. Besides the beautiful floral bouquet above, we will offer many fantastic flower designs. You can choose from completely unique and custom or from the roughly 40, tailored to mother’s day designs we’ve created. We also offer a nice selection of chocolates, green plants, blooming plants, gift items, stuffed animals, balloons and more. 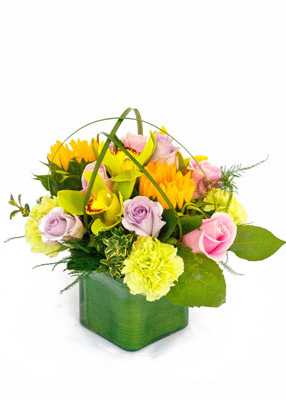 For Mothers Day Flowers Medford Oregon we make it easy and offer three ways to order. Call us at 541-664-1878, shop online on our website at www.judysflorist.com or come in and see us anytime at 337 E. Pine St, Central Point. We are open from 9-5 Mondays through Saturday for The Mother’s Day holiday week. Our phones are answered 24 hours each day and by our answering service during our closed hours. However you decide to order flowers for you mom, we look forward to serving you. Administrative Professionals Day is celebrated in many countries around the world. The goal of Administrative Professionals Day is to recognize the work of the people that help keep businesses strong and functional. In the past and even today it is also known as Admin Day or Secretaries’ Day. Judy’s Central Point Florist is always ready for Administrative Professionals Day. We offer delivery to Medford Oregon and to all of its surrounding cities. Our delivery charge to most Southern Oregon businesses is only $9.99. We here from our local businesses often on how excited people get when they see our vans pulling up to their door. Wondering what to send for Administrative Professionals Day? We have many specials available each year. A very popular way to say thank you is with a rose. We offer single, doubles, triples in rose bud vases. We will also delivery many half dozen and full dozen rose designs. When it comes to color, we will generally suggest any color other than RED. The red rose is the one rose that has kept its sentimental meaning and it usually signifies love and romance. We offer many other colors of roses on a daily basis to keep you covered for whatever the occasion. Other Administrative Professionals Day gift ideas often include hand made chocolate truffles, fragrant candles, or thank you, mylar balloons that seem to float forever. We carry all of these ideas and more. We can also offer delivery of theses items with or without flowers with a minimum purchase of 12.99. You can find photos of many of the items we offer on our website at www.judysflorist.com. So, for showing your appreciation of and thanking the folks that help make you and your business strong this Administrative Professionals Day, think of Judy’s Central Point Florist. We can deliver your flowers and gifts to Medford Oregon, Grants Pass Oregon and to all of their surrounding cities.